It's always fun to experience how shape and size affect the taste of pasta. One of the best examples is couscous. Upon first taste, most people enjoy it, but can be surprised to learn that the tiny grains are semolina pasta. At one time it was an exotic food for many Americans, but now it's appearing with greater frequency at meals. I think the texture and flavor is fabulous, as well as the minimal cooking time required to make it. 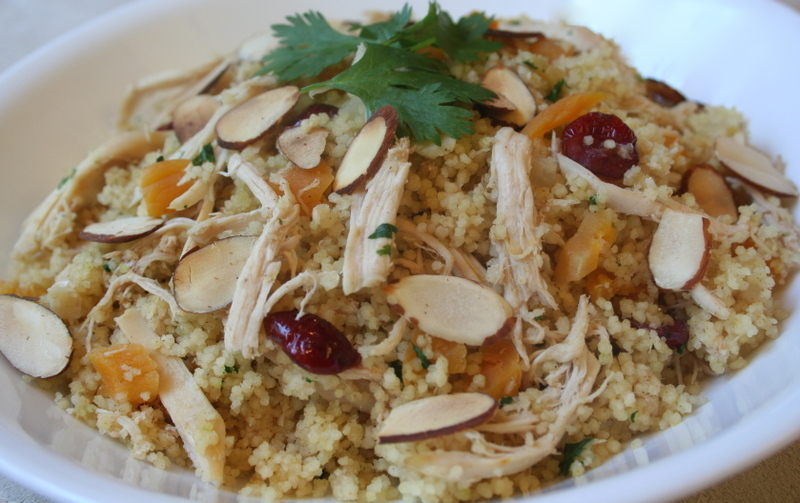 So, as Presto Pasta Night, the event created by Ruth at Once Upon A Feast, has rolled around again, I did a mental review of pasta and imagined a heaping plate of couscous, shredded roast chicken, dried fruit, and almonds. So, here it is. It turned out to be a good dish. I would increase the cumin the next time, but I love cumin and can be heavy handed with it. If you make this dish, you might want to add salt. The recipe didn't call for it and I thought it needed some. As well, be careful measuring your couscous. I was sloppy and measured a little more than the amount specified in the recipe. This produced a fluffy dish that tasted good, but I would have preferred a tad more moisture. I also think pistachios would taste even better than the almonds. Any excuse to eat pistachios, I say. Stop By Ruth's site on Friday to check out the Roundup of pasta bloggers. Stir in the couscous, re-cover the pan and remove from the heat. Let stand until the liquid is absorbed and the couscous is softened, about 5 minutes. Add the cilantro and toss with a fork to fluff the couscous and distribute the cilantro. Garnish with the almonds and serve. Serves 4. I make a similar dish with Israeli couscous, and I replace part of the couscous cooking liquid with orange juice, which makes a nice compliment to the dried fruit in the recipe. In fact, I think I'll make some version of your recipe and mine for a potluck this weekend! Sher, this sounds so good! I just had some couscous during the week as well... They are so good. Love it. Sounds very good to me. I was at a partly recently and had something made with 100% whole wheat couscous, which I'm quite anxious to try in a recipe. The couscous dish looks delicious. It will be on next week's dinner menu. Now, I knew couscous was a type of pasta but I wasn't sure if it counted for this event. I'm glad to see that it does. I might be able to enter presto pasta nights much more often now! Wow! So pretty. That dish is really appealing, Sher, to the eye, to the palate, and to my laziness. Yum! It really does look like a beautiful dish. I often do a citrus couscous salad with nuts and dried cherries, but this looks like another great option. Couscous, I always forget about the little baby pasta. Yours looks delicious! Funny-I make this same dish but with tofu instead. It's always a lunch favorite. 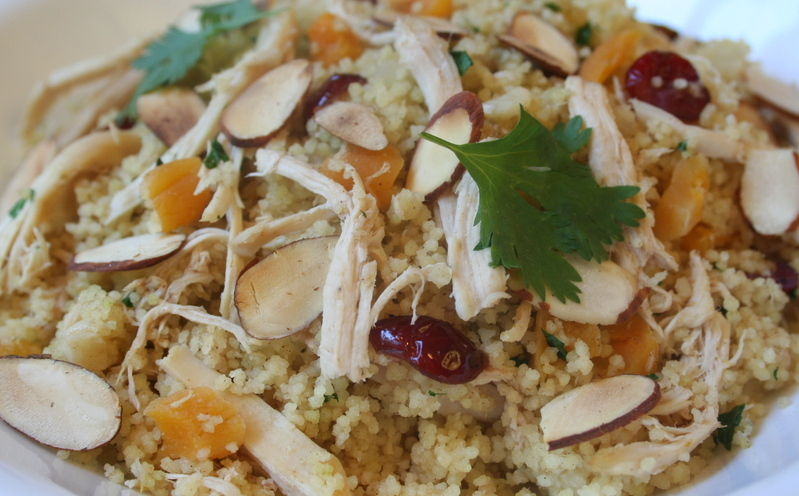 ooooh, this is one of my favorite couscous-y dishes! I made it recently with green almonds and it was delish! 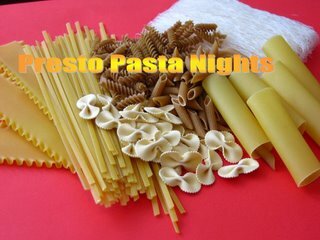 I love presto pasta night! This looks fantastic. Bookmarked to try soon.